One of the only good things about New York’s muggy heat is the amount of ice cream spots there are to help you cool down (so many, in fact, that even Mister Softee has entered into a turf war). 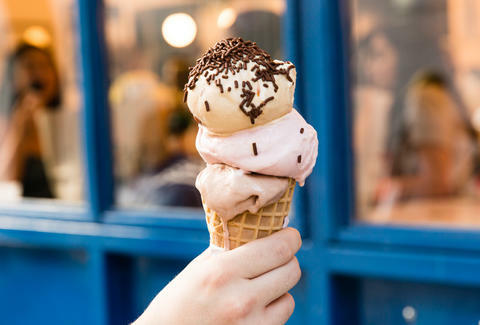 From nostalgia-inducing flavors in the East Village to waffle cones outfitted with cotton candy in Chinatown, these are the best places for ice cream in NYC. This extraordinarily hipster burger and ice cream joint operating out of an Airstream at the William Vale Hotel offers “dairy dips” -- chubby swirls of soft serve dipped in fast-hardening glazes and covered with unconventional toppings -- alongside some pretty great skyline views. Head there just before the sun sets and choose from one of three varieties: the Jacker-Crax with buttered popcorn and salted peanuts, the Malter Cronkite with a vanilla and chocolate malt twist, and the Berry Gibbs with a strawberry glaze and whipped cream. 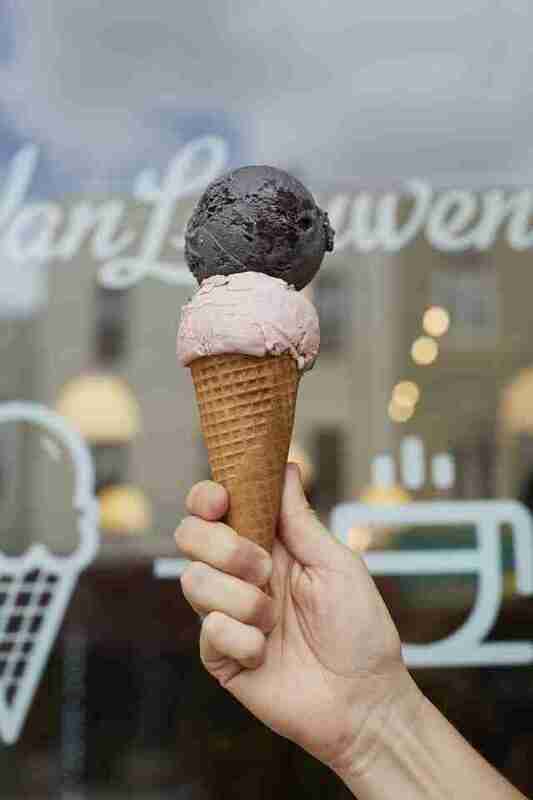 Named after a Walt Whitman poem, cult-favorite Ample Hills began its operation in Prospect Heights in 2011 and quickly expanded to multiple locations outside of Brooklyn, as well as supermarkets nationwide. It’s known for its over-the-top ice cream concoctions, like Ooey Gooey Butter Cake (a creamy vanilla ice cream mixed with chunks of St. Louis-style butter cake) and The Munchies (a pretzel-infused ice cream with bunches of Ritz crackers, potato chips, pretzels, and M&Ms). New York’s first ice cream barlour (yes, barlour) is serving up ice cream that can actually get you buzzed. All of the flavors, which are inspired by alcoholic cocktails, are just below 5% ABV (the equivalent of a light beer). Between flavors like Maple Bacon Bourbon and Dark Chocolate Whiskey Salted Caramel, chances are you’ll leave feeling a little something. Dominique Ansel’s summer-only soft-serve window is open from Wednesdays through Sundays, but it’s worth visiting before the end of the season. 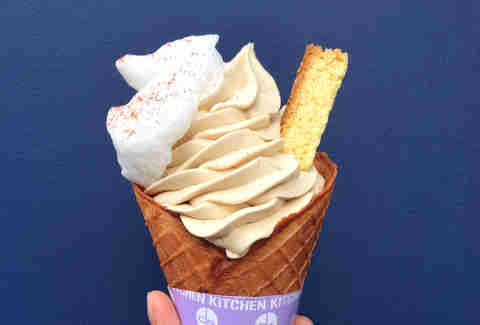 Here, you’ll find innovative takes on traditional soft serve that almost rival the baker’s famed over-the-top pastries. Ansel’s signature burrata soft serve is served all summer, and each month a new flavor will be introduced: Through July, there will be a cold brew soft serve with anise biscotti and milk foam, in August, the team has plans for a peach tea soft serve with honey roasted peaches and lemon powder, and in September there will be a dark chocolate olive oil flavor, accompanied by a fig agrodolce and sea salt. Time has stood still for over 100 years at Queens’ Eddie’s Sweet Shop. The old-school soda fountain gets its charm from the wooden stools that shakily spin over the mosaic tiled floor, coupled with the locals who have been coming here since they were kids. 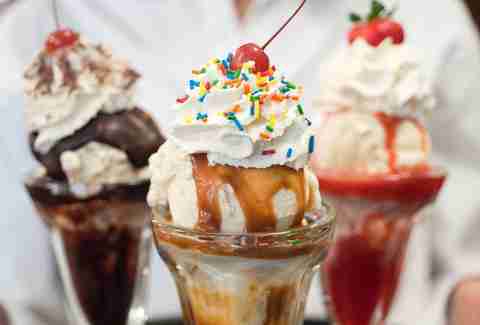 All the ice cream (and most of the toppings) is made in-house (the tangy clouds of whipped cream are hand-whipped), and is straight out of another era: thick hot fudge and strawberry sauce are generously applied to scoops, while milkshakes whir and floats plop behind the counter. 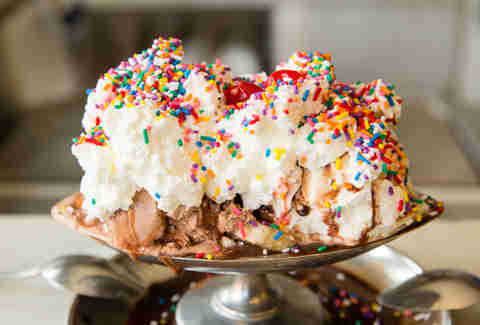 Perch yourself at the counter and treat yourself to one of the massive, overflowing sundaes, served in a silver tin cup. Eco-conscious, Brooklyn-based creamery Blue Marble not only boasts an ethical operation, it also uses all-premium ingredients (like organic dairy from upstate NY cows and fair-trade chocolate). The flavors are mostly the basics -- “elementals,” as founders Jennifer Dundas and Alexis Miesen like to call them -- along with a couple of elevated classics, like Mexican Chocolate and Midnight Mint Cookie. 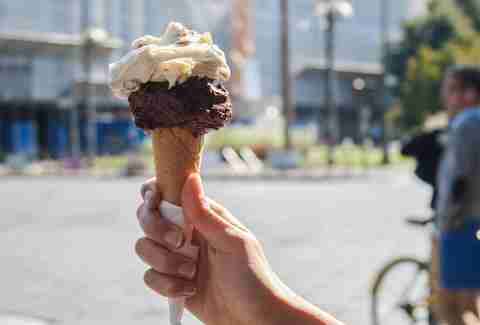 During the summer, Blue Marble sets up ice cream carts at Brooklyn Flea, Pier 6 (at Brooklyn Bridge Park), and Governors Island, so you can get your fix almost anywhere. Morgenstern’s is probably best known for its ridiculously priced, $20 King Kong Banana Split (made with bananas, five scoops of ice cream, sesame caramel, pineapple, and Luxardo) and elaborate flavors like Black Coconut Ash (which yes, will turn your mouth black), but it’s the reinvented classics that are actually worth seeking out. 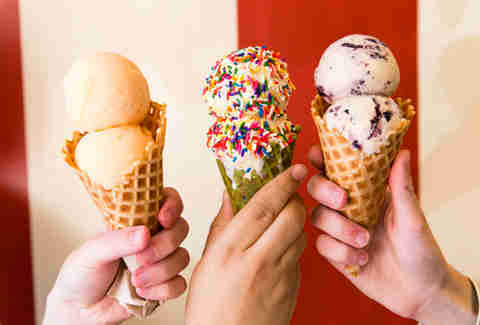 Here, there’s no such thing as a simple vanilla; instead, there’s Bourbon Vanilla, or Madagascar Vanilla, or Rose Milk. Coffee flavors range from Vietnamese Coffee dripping in condensed milk to a nutty hazelnut version. And rest assured, all are priced at a far more reasonable $5.50-9.50. 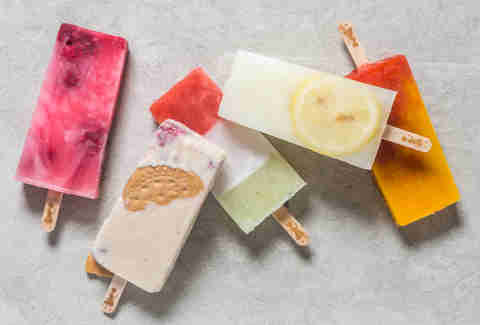 Mexico native Fany Gerson (formerly of Rosa Mexicano and Eleven Madison Park) started La Newyorkina as a humble stand selling paletas (creamy, fruity, or spicy Mexican-style ice pops) at Hester Street Market, before it became a full-fledged ice cream shop. The star of the menu, the nieve de garrafa, are traditional, handmade Mexican ice creams (like tres leches and horchata) that get topped with garnishes like spicy candied mangoes and pumpkin seed brittle. What was once a 1920s apothecary now offers a vast assortment of over-the-top old-school sundaes, milkshakes, floats, and ice cream sandwiches. Brooklyn Farmacy brings on the diner charm, slinging everything from classic favorites like black & white milkshakes to novel sundaes like the caloric 99 Problems: a warm brownie topped with chocolate ice cream, doused with a vanilla milkshake, and finished off with a dark chocolate shell, whipped cream, shaved chocolate, and a cherry. 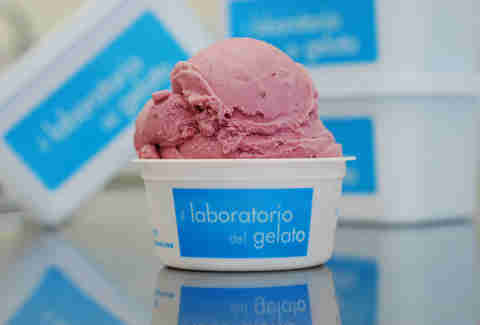 il Laboratorio del Gelato owner Jon Snyder -- previously of Ciao Bella -- has been making small-batch gelato and sorbet using seasonal, local ingredients when he opened the original window-front business on Orchard Street in 2002. While the flavor list has grown past 300 at this point (including sweet potato, avocado, maple, pink peppercorn, and mascarpone), as well as the expansion of the operation, the scoop shop offers a rotating selection of 48 flavors daily, with the most popular flavors (dark chocolate, salted caramel, and vanilla) remaining in the case. 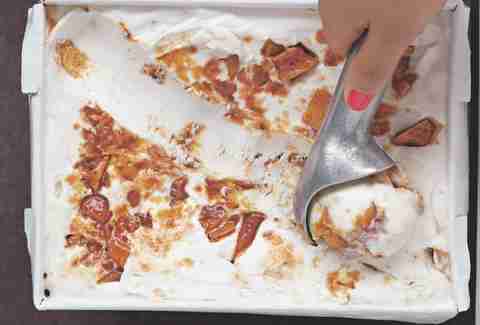 With all the artisanal, over-the-top ice cream scattered around the city, it’s become increasingly rare to find any that resembles classic, childhood flavors you cherished as a kid. Davey’s is that shop. Come for the nostalgic taste of strawberry, mint chip, and cookies and cream and the homemade waffle cones, cookies, and brownies, and let your legs dangle off a stool while peeking through the production window to see the ice cream churning in the back. 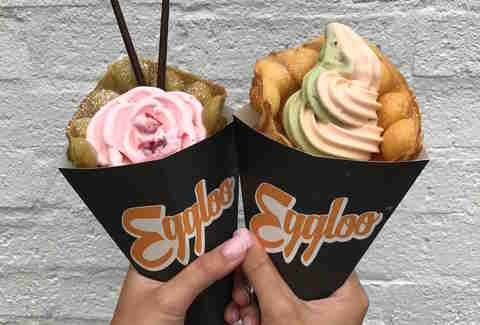 Taking influence from a popular Hong Kong street food, Eggloo opened its doors in Chinatown last summer to much Instagram fanfare. Starting with a base of Hong Kong egg waffles (a sheet of light and crispy cake-like balls) folded into a cone, guests can add on their choice of classic or seasonal ice cream flavors (from vanilla to green tea) before piling on unlimited toppings, including Fruity Pebbles, mochi, Pocky, condensed milk, and more. If you’re particular about your gelato being from Italy, then Grom is the spot for you. Each batch starts its life in Turin where a “liquid mix” is created from locally sourced organic fruit, cage-free eggs, and other highly scrutinized sources. While the menu rotates month to month, flavors from the classic menu, like Crema Di Grom, a combination of pastry cream, chocolate chips, and homemade meliga cookies, are the most popular. It wasn’t too long ago that Van Leeuwen strictly sold its creative vegan and regular ice creams out of a roaming yellow truck. 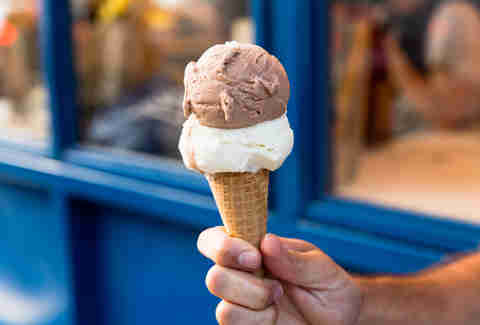 But even after expanding to several scoop shops it remains an NYC ice cream staple. If you’re a dairy-eater, don’t miss the honeycomb, Earl Grey tea, or any of the monthly specials (previous renditions include a black sesame ice cream with ash and chocolate cake, and a mango matcha jasmine). For non-dairy eaters, opt for the cashew-based vegan flavors (like chocolate chip cookie dough and caramelized banana nut), which somehow taste just as good as the real thing. 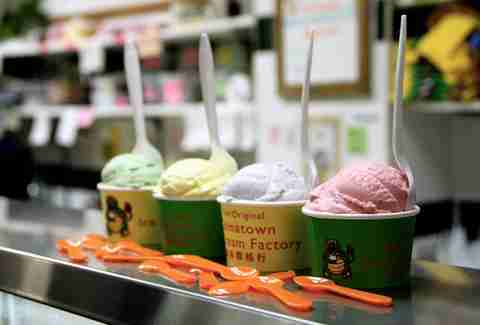 A neighborhood institution, the family-run Chinatown Ice Cream Factory has been scooping ice cream for nearly 40 years. Order from the “regular” menu, which offers Chinese-inspired flavors like Almond Cookie, made with Famous Fung Wong Bakery’s Chinese Almond cookies, or Chinese Red Bean. The “exotic” menu flaunts flavors foreign to China: vanilla, chocolate, and strawberry. 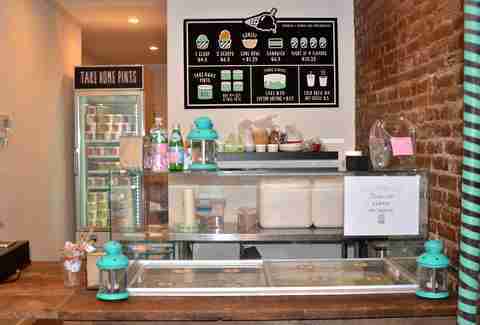 This experimental ice cream shop brings an eccentric charm to the LES. Each flavor feels like an entire meal has been united in a single scoop: Ants on a Farm piles on the savory and the sweet, incorporating a mix of raisins, celery, and gianduja chocolate chips, while Olive Garden flaunts an Italian twist, with black garlic, olive oil, and a sweet corn crumble. You’ll also find ice cream pies and sandwiches (both of which can be added on top of scoops), like the Detention Ice Cream Sandwich -- malted vanilla ice cream rolled in Fruity Pebble dust and book-ended with Mexican chocolate brownies. When a scoop of ice cream isn’t enough, just add a colorful cloud of cotton candy. At least, that’s the thought process at Wu Kong, a shop that’s garnered a consistent following for its unicorn-esque ice cream creation made by swirling pink or blue sugary cotton candy around a waffle cone, hence the “cloud,” resulting in an ice cream mountain topped with sugary treats like caramel corn and frosted animal crackers. Wu Kong also makes and an “ice cream burger,” featuring a thin, hollowed-out crepe-like bun, filled with the ice cream and toppings of your choice. Part of the Momofuku empire, Christina Tosi’s playful bakery has made an inarguable impact on the New York dessert scene -- particularly when it comes to ice cream. 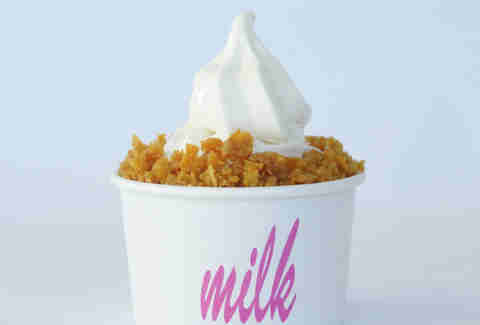 Designed to taste “just like the milk at the bottom of a bowl of cornflakes,” the shop’s ever-popular Cereal Milk flavor is the perfect mix of sweet and salty, and truly does taste just like cereal milk. 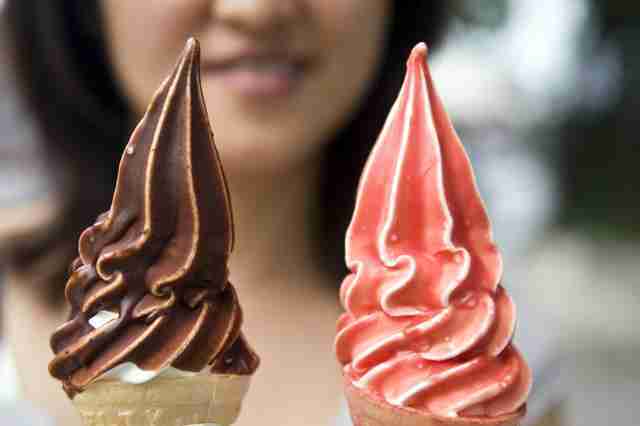 Top it off with some corn flakes or sprinkles, or twist it with one of their rotating flavors, like B’day Soft Serve. Asian-influenced flavors reign supreme at this popular East Village standby, where on hot summer nights ice cream lovers overflow onto the sidewalk clutching cones. 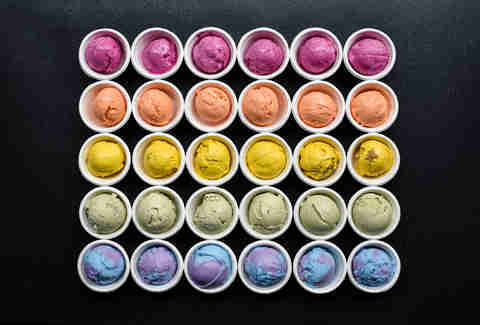 Tubs of orange creamsicle and cookies and cream are readily available, but your best bet is to go with one of the more unique, Asian-inspired flavors, like taro, black sesame, lavender, and green tea. 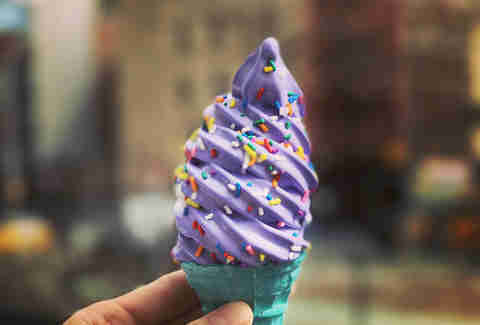 Soft Swerve’s brightly colored, Asian-inspired flavors have been a hit ever since Ube (purple yam) became mainstream. 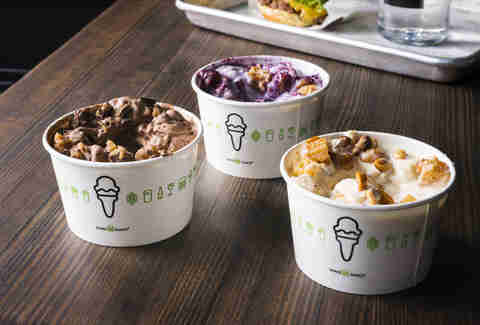 The shop offers some seriously creative concoctions, like the Brooklyn Bridge -- black sesame ice cream, Reese’s Puffs, mochi, and a chocolate drizzle -- but the move here is one of the two swirl flavors: ube and macapuno coconut or matcha and black sesame. Mister Softee will forever feel like the epitome of summertime nostalgia, from the charming yet irritating cyclical jingle to the old-school, food coloring-enhanced ice pops. 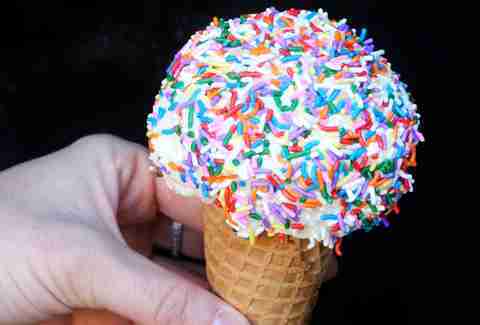 But what’ll really bring you back to your childhood years is a cone of the chocolate and vanilla twist, dipped in chocolate, cherry, butterscotch, or fudge magic shells, and showered with sprinkles. 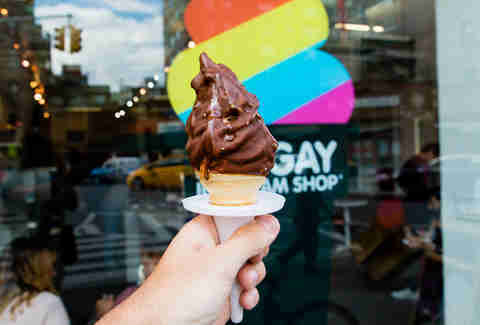 In 2009, Big Gay Ice Cream began selling its imaginative soft-serve creations out of a single truck. Since then, it’s expanded to three brick & mortars in Manhattan, a shop in Philadelphia, and even sells pints in grocery stores. It’s known for putting an eclectic spin on ice cream cones and sundaes -- all with humorous names, like the Salty Pimp (vanilla soft serve with dulce de leche, dipped in a chocolate shell), and the Rocky Roadhouse cone (chocolate soft serve with toasted almonds and chocolate-coated mini-marshmallows). Big Gay also uses its platform to donate money to the Ali Forney Center, an organization that makes a positive difference in the lives of homeless LGBTQ youth, by holding clothing drives and other initiatives. 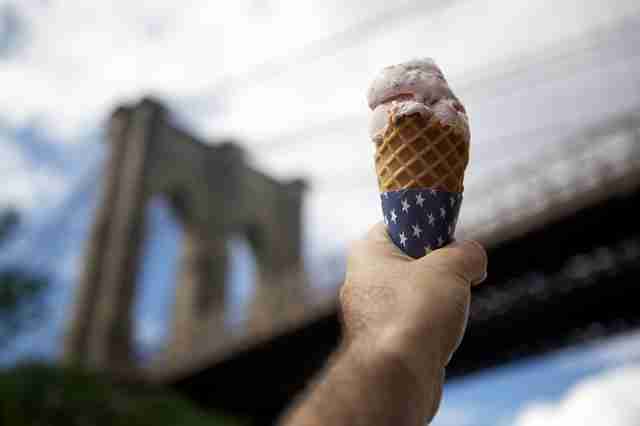 The sweetest reward after hauling yourself across the Brooklyn Bridge is a stop at Brooklyn Ice Cream Factory. Stationed in a ‘20s-style fireboat house facing the East River, the factory offers a trim selection of ultra-milky and creamy classics: chocolate, vanilla, coffee, butter pecan, strawberry, and peaches & cream. While the ice cream is satisfying on its own, you’d be unwise to skimp on the toppings and syrups, which are all made by the neighboring River Cafe’s pastry chef. New York’s favorite burger chain is the perfect place for a summer day: a great burger, crinkle-cut fries, and rich, frozen custard blended with a myriad of toppings. The custard is served in a handful of ways -- as shakes, cones, and concretes (frozen custard spun with add-ins like peanut butter and chocolate chunks) -- and while each location has its own neighborhood speciality concrete (and seasonal creations), the ever-popular Shack Attack, made with over five different types of chocolate, including chocolate truffle cookie dough, is available everywhere. If you haven’t tried Thai-inspired rolled ice cream, then you’ve definitely seen footage of it on Instagram. At 10Below, ice cream is smashed on a -10 degree surface (hence the name) with anything from Nutella to condensed milk, then delicately rolled into quaint tubes of ice cream. 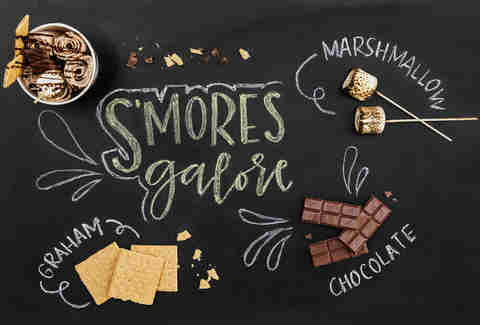 Among the list of artful concoctions is the S’mores Galore, which gets finished off with a torched marshmallow. OddFellows is indeed odd. With over 100 flavors to date, and a passion for mixing savory and sweet, the shop offers out-there flavors like Buttermilk Honey Blueberry, Coconut Kaffir Lime Leaf, and Chorizo Caramel Swirl. The East Village location also specializes in DIY ice cream sandwiches, called Odd Pockets (essentially brioche sandwiches stuffed with cornbread ice cream, cornflake crunch, with a rich blueberry compote). 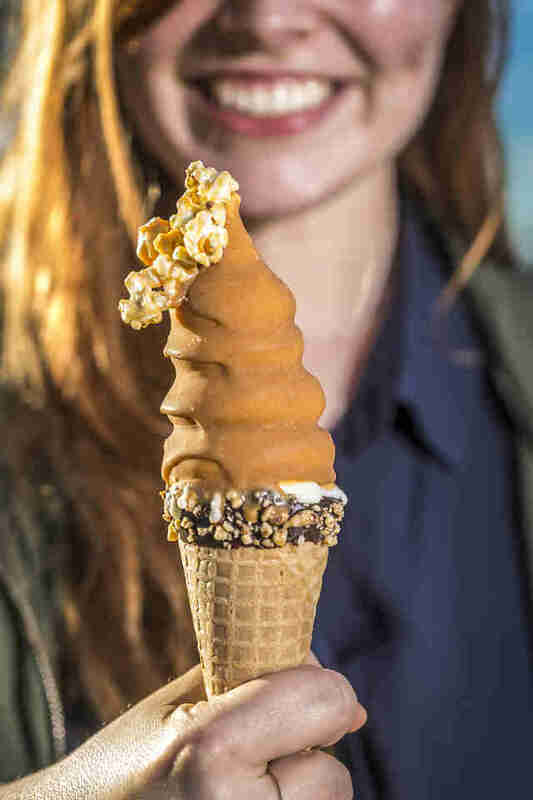 Also, this summer you’ll find a special OddFellows Carnival pop-up at SoHo’s Chef’s Club Counter, serving composed dishes like the Concession Stand (caramel popcorn soft serve injected with salted caramel and finished off with salted caramel popcorn and chocolate pearls) and a variety of soft serve flavors like raspberry sherbet and tangerine. 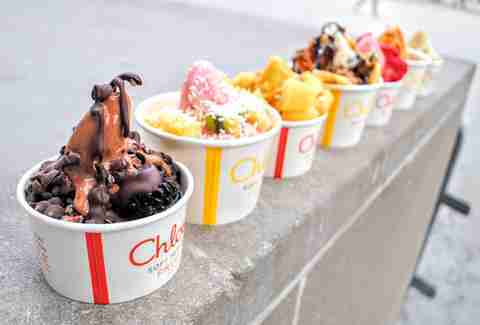 While Chloe’s fruit-heavy menu might make it seem like one of those ice cream alternatives that’s entirely guilt-free but tasteless, it’s actually far from it. The fruit soft serve, which comes in banana, dark chocolate, mango, or strawberry, is arguably healthy, yes -- the only ingredients are fruit, water, and a bit of cane sugar -- but once you start piling on chocolate sauce, pretzels, and chocolate chip cookies (which you absolutely should), it becomes considerably less so. Holey Cream’s build-your-own ice cream donut sandwiches are not for the faint of heart. 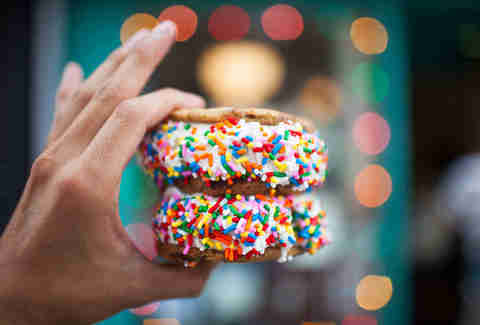 Pick your donut, frosting, ice cream, and toppings, before cutting the donut in half to act as the “buns” for your sandwich. Indulgence is key here, so if you’re looking for a Nutella-frosted, strawberry ice cream donut sandwich with Fruit Loops and gummy bears, this is the place to find it. Amy Schulman is an Editorial Production Assistant at Thrillist who only eats chocolate ice cream. Follow her on Instagram. Tanner Saunders is an Editorial Ice Cream Assistant at Thrillist who screamed for ice cream a lot in the making of this article. Follow him on Instagram.